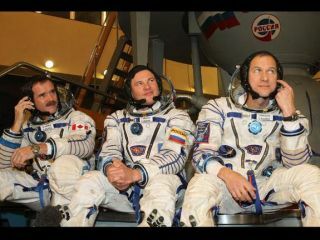 Expedition 34 Flight Engineer Chris Hadfield of the Canadian Space Agency (left), Soyuz Commander Roman Romanenko (center) and NASA Flight Engineer Tom Marshburn (right) are scheduled to dock with the International Space Station from the Soyuz TMA-07M spacecraft on Friday morning, Dec. 18. The Russian Soyuz spacecraft carrying the three newest residents of the International Space Station is set to dock with the high-flying laboratory on Friday morning (Dec. 21). Set to arrive at the space station at 9:12 a.m. EST (1412 GMT), the capsule will deliver Canadian Space Agency astronaut Chris Hadfield — who will become the station's first Canadian commander — as well as Russian Federal Space Agency cosmonaut Roman Romanenko and NASA astronaut Tom Marshburn. The spaceflyers' journey started yesterday (Dec. 19) when they launched from Kazakhstan's Baikonur Cosmodrome at 7:12 a.m. EST (1212 GMT). After they reach the space station, the astronauts will perform leak checks on the seal between their Soyuz TMA-07M capsule and the space station's docking port on the Rassvet module. These checks should take about two hours, clearing the way for the hatches between the two vehicles to be opened at around 11:45 a.m. EST (1645 GMT). Three crewmembers are already living onboard the space station awaiting the new arrivals: commander Kevin Ford of NASA, and cosmonauts Oleg Novitskiy and Evgeny Tarelkin, both flight engineers for the station's Expedition 34 mission. Once the new trio joins them, the Expedition 34 team will be complete, bringing the orbiting laboratory back up to its usual six-person crew complement. This flight will mark Hadfield's third trip to space, and second visit to the International Space Station.